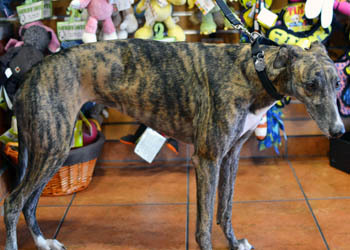 Catalina, aka C Ya Catalina, is a 4-year-old brindle female born May 28, 2008. Her sire is Dodgem By Design and her dam is C Ya Movada. 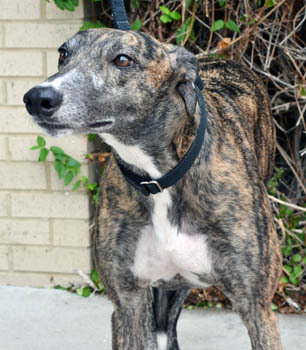 Catalina has 74 races to her credit, all at Gulf Greyhound Park. She began her career on December 23, 2010 and ended it on July 20, 2012 with a torn plantar ligament. 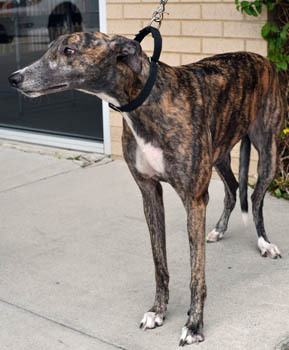 Surgery was performed by Dr. Stephen Kerpsack of Central Texas Veterinary Specialty Hospital and her leg was repaired with the placement of one plate and five screws. After recuperating in her foster home, she has now gotten a clean bill of health from Dr.Kerpsack, but if the plate or screws cause irritation in the future, they may need to be removed. Catalina should not live with cats.